How Much Do New Kitchen Cabinets Cost in 2019? Many homeowners are planning to renovate their kitchens. And, why not? It is the best method of adding value to your home. It’s also one of the most expensive, so be careful not to overspend when looking to sell. To get a better idea of the equity boost you could see, ask a local realtor how much similar homes in your neighborhood are going for and get an appraisal. Then you know how much equity you have and how much value a renovated kitchen can add. Of the 1,337 Houzz readers who responded to their survey and reported remodeling their kitchens within the previous year, 78 percent upgraded their kitchen cabinets. Fifty-five percent chose either light gray or white colors for their kitchen, with 69 percent choosing stainless steel appliances. Your kitchen is generally the focal point of your home. It is where you and the family gather while cooking holiday meals. If you want to make a first and lasting impression on your guests, it usually starts in your kitchen. One of the most substantial elements of any beautiful kitchen is an impressive row of cabinets. Although there are less expensive options such as repainting, refinishing, or resurfacing your kitchen cabinets, a new set may be in order. Especially when the old set is vinyl-clad or made of pressed board with veneer covering. New paint or varnish might not be possible. Therefore, if you choose new, there are three fundamental choices; off the shelf, semi-customized, and fully-customized and made-to-order. Whichever you prefer, the prices will vary widely, though the national average for a new 30 linear foot set is $5,000, with a high end of $30,000 for fully-customized cabinets. The problem many people have with stock cabinets is they will see the same cabinets in many homes. They want something original, and when you are spending that much money, you should get what you want. However, stock cabinets are much more affordable. You can expect to pay $50 – $200 per linear foot for cabinets and materials. Another $50 – $100 for installation. Therefore, your total should be around $100 – $300 per linear foot installed. Be careful choosing laminates and veneers that will get placed next to the stove, as many homeowners report bubbling and lifting due to steam and heat. Ask a cabinet installer before you buy. 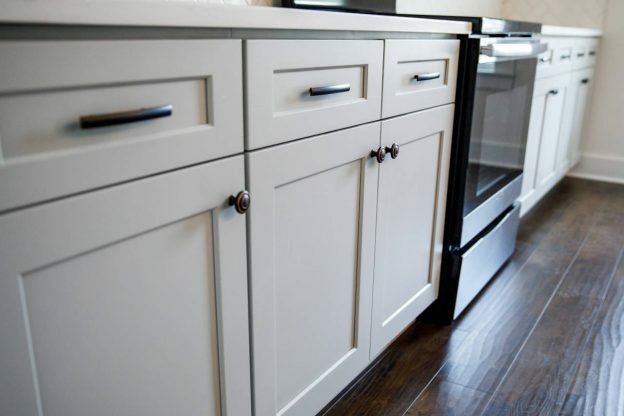 If the cabinets do not come with preset pull, knobs, and hinges, we suggest buying those and installing them yourself. The manufacturer usually pre-drill the holes, and all you need to do is screw them in place. There’s no sense in paying $32 – $100 per hour to have someone do that, unless you have more money than time. These are basically the same as stock cabinets, however, the purchaser can ask for different doors, deeper cabinets, and resized drawers. These changes are usually not free unless you find a dealer willing to adjust to make the sale. With minor changes, expect to pay $75 – $400 per linear foot for materials and hardware. As with stock cabinets, you might get the dealer to change the hardware for a price or leave those out for a discount and add your own. Expect your final price installed to be $200 – $500 per linear foot. Fully customized cabinets usually begin with a designer who will charge $200 to $300. Then, depending on the number of units, material quality, and the amount of customization needed, you could spend up to $30,000. New high-quality woods such as cherry, walnut, or mahogany cost $15 – $30 per linear foot just for the door and face-frame materials, and then there’s the expense to the cabinetmaker and the installer. Installation alone will cost $50 to $200 per linear foot. Plus, new hardware if you are replacing those. You may run into a problem where the supplier does not carry an island in the same material as your cabinets. Always ask the dealer if you don’t see an island on display. Stock cabinet makers typically make some islands to go with cabinets, but others require special order and might take longer to get. Another option is to hire a local carpenter to refinish your current island to match your new cabinets. Most woodworkers will have no problem matching the wood and color. On the other hand, if you buy cabinets made of laminates or PVC, those might be more difficult to match. If the dealer cannot get those for you, it might be wise to make another choice. Now that you have a general idea of how much it will cost for new kitchen cabinets, you can shop smarter. Then, after you choose your new cabinets, it’s time to get them installed. Get a few estimates from local contractors who are licensed, insured, and have references. We suggest getting at least three estimates to get a good idea of the options available and to be able to select the best contractor for your project. Checking in with your local Better Business Bureau and the Building Inspector’s office will not only will they give you valuable information on possible contractors, but the building inspector will tell you if you need a permit and if your chosen contractor has multiple open jobs that have lingered. Whether you choose stock, semi-customized, or fully-customized kitchen cabinets, a professional install can make a world of difference.